People, Christmas is three weeks from today. Three! I need to get serious about what I want to do and what I will be able to do before that happens. It is definitely time for a prioritized list. Any pottery I want for giving needs to be ready for firing by this weekend. 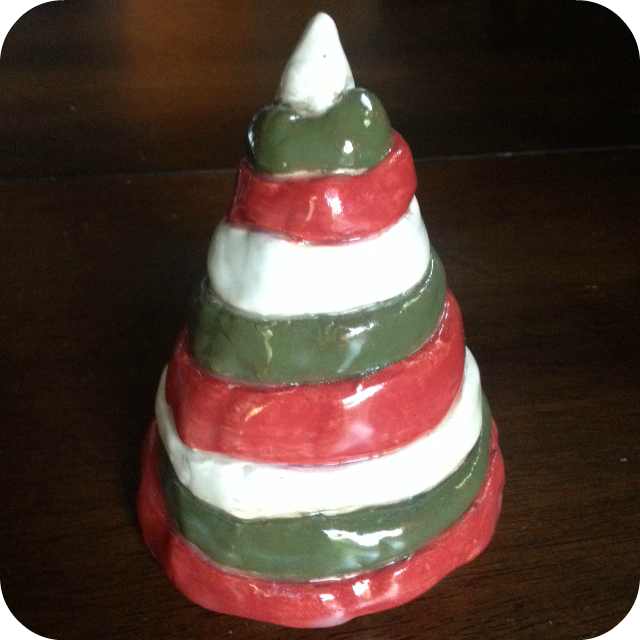 It may already be too late–December is a busy time for the kiln! At a minimum I want to finish up some of the small medallions I made to make into magnets and complete whatever coil trees I have already built. These things need to be painted with underglaze and fired, then dipped into clear glaze and fired again. Hopefully I can get them done quickly. There is a very good chance that my list of finished projects will look nothing like this list, but I like having a plan to start with at least. I feel pretty good about the first priority items, although not entirely certain. 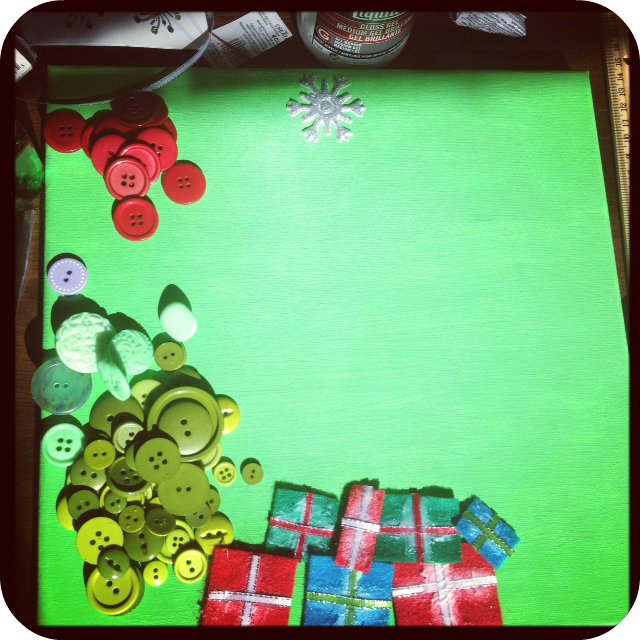 How are your Christmas projects coming? 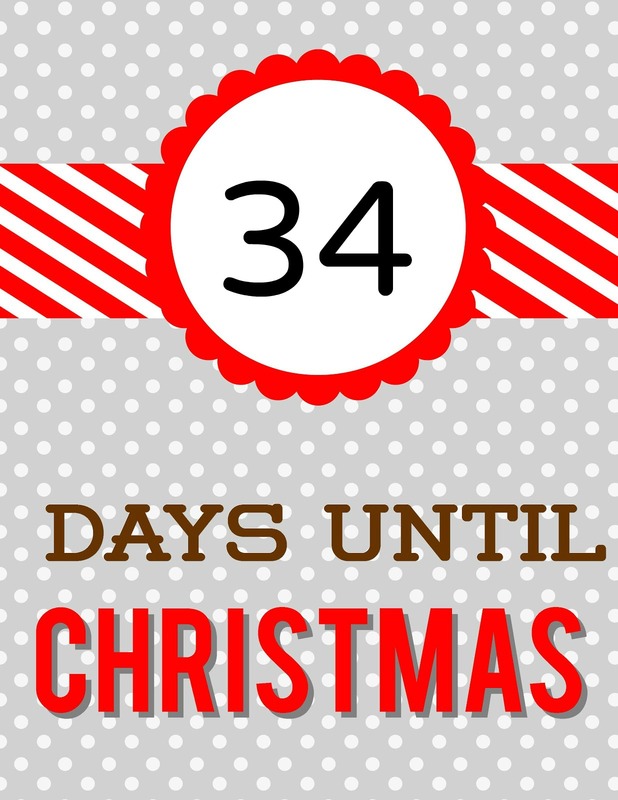 Christmas is 34 days away! Time to take stock and kick into high gear on my remaining projects! What do you think? Too ambitious? How are your handmade projects coming? Since I stumbled across the concept of the Buy Nothing New Christmas, I have been thinking about how I could do this, and if I really want to completely forego new things in my gift giving. I found an interesting webpage, Buy Nothing Christmas, that helped me think through what this concept means to me, and what I would like to get out of it. To me, the point is not to save money, or at least that is not the main point. The main point is to get out of the disposable mindset of our culture. The level of stuff our society produces is simply not sustainable, especially if you are giving any thought to raising the standard of living for third world countries and for poor people all over the globe. The waste produced by one household is staggering to me–4.4 pounds per person per day, or 1600 pounds per person per year. I don’t want to opt out of gift giving, though. 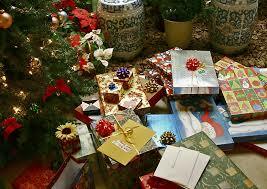 I love giving gifts and I think it provides an important social role, bringing friends and families together. I just want to be a bit more thoughtful about how I do gifts. 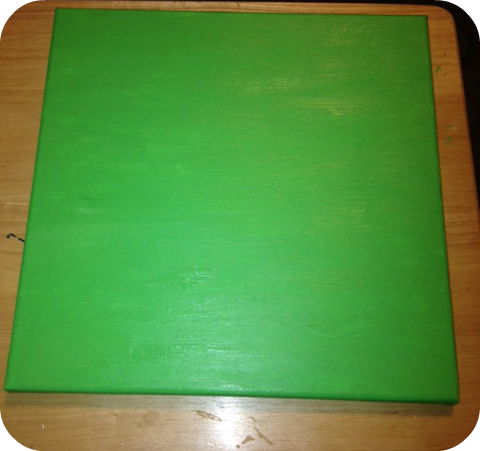 I am also a bit hesitant to take on a project with strict rules. I have a problem with perfectionism–it often leads to an all or nothing mentality where you either do something perfectly, or this is no point to trying at all. I think that sort of thinking is detrimental to actual change. For instance, if everyone was able to cut down on buying just a few new things, it would have a much larger impact than a small handful of people foregoing new things entirely.There is benefit to doing something even if it isn’t technically *all* that could be done. With all that in mind, here are some guidelines and tips I am going to use to buy less new things this year. 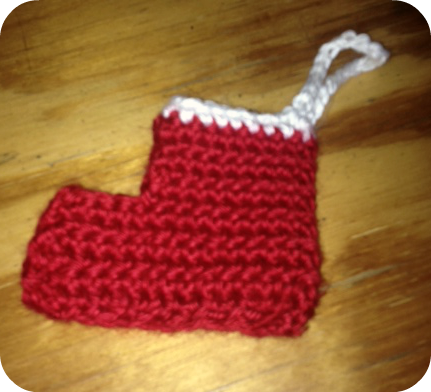 Upcycle Exchange is a good local source for used craft supplies–thanks for the reminder, Hilary! Goodwill is a good resource; have been thinking about going to the dollar store to buy mugs, then crocheting cozies for those mugs, but I could find mugs at Goodwill, I am sure. What do you think of the Buy Nothing New Christmas concept? Is anyone else attempting it this year? I think this is a great idea, although I am not sure I can fully do it. If I buy new crafting supplies, does that count? Plus, the kids might be disappointed if they don’t get some new things. I have definitely given a lot of thought to giving only gifts that I have made, though, and we could certainly do clothes from the resale shops and stay in this challenge. What do you think? Can you go without buying anything new for Christmas? A few years ago, in the spirit that I like to do most things in – completely last minute – I decided I was going to have a Buy Nothing New Christmas. There seemed to be a lot of chit chat going on in the blogosphere about having periods of buying nothing new, and nothing motivates me more than a challenge! So I dove in head first and have to say it was such a satisfying experience that I have *almost* done it every Christmas since. In fact, I was so motivated, my Buy Nothing New challenge continued for the first six months of 2011! The pottery classes I have been taking include unlimited studio time during the class for building pieces, and plenty of time after the class is over to finish glazing and firing pieces. I have been concentrating on building things during the class time with the plan of underglazing, glazing and firing objects after the class is complete, but a couple of weeks ago, I decided to get a couple of test pieces done so I could see how they would turn out. This was completely unfired, with just the build done and underglaze painted on. Since then, it went through an initial firing, then I dunked it in a clear glaze and had it fired again. The colors are very different than the pre-firing colors, but they did turn out very close to what I pictured when I was envisioning the finished project. I also glazed one of my little plates, and I am very pleased with how it turned out. Because of the stamped pattern, I was thinking that I would need to underglaze the plates in order to ensure that the color got down into the grooves. I made a ton of these plates, though, so I decided to try the regular glazing on one and see what would happen. As you can see, awesomeness happened, ;). I am still going to underglaze a few plates–I have at least 30 of these things–but I will be doing more like this as well. 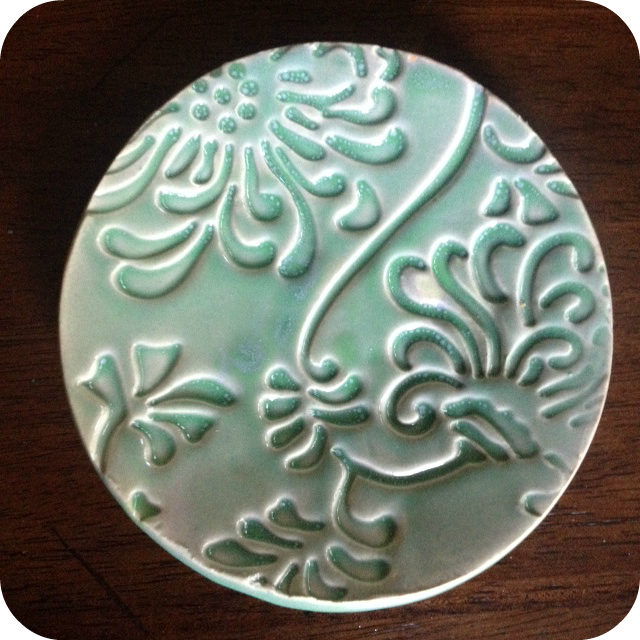 This plate has celadon as a first dip, then it is topped with lime green. I love the way it turned out! 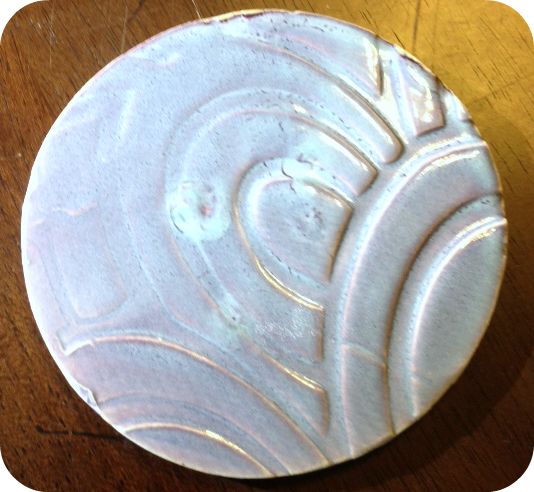 The coaster shows me why it is good to do a test glaze. I used deep purple topped with celadon here, and how a dark purple topped with a pale green yields such a blue coaster, I don’t know. I kind of like it, though. 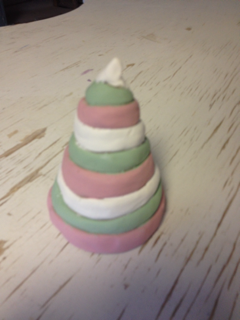 So, that’s all I have for finished pottery for now. What do you think? 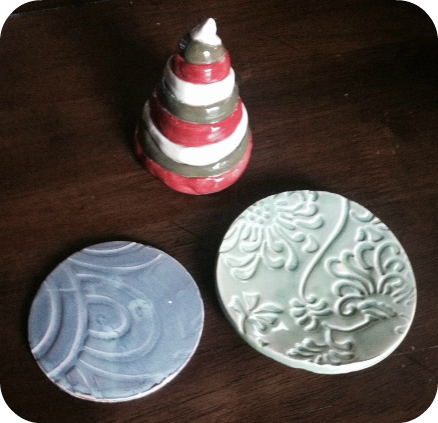 I will be making many more trees and plates, and probably some more coasters, along with a few other things. I am probably nearly finished with building for this Christmas, but I will have more things coming, too, as I still have about 45 pounds of clay to use. Any suggestions for a not-terribly skilled hand building potter?